It looks like the massive Midtown burger explosion of 2010 has finally caught up with at least one spot in Midtown. The Goodburger on 45th street btw. 5+6th has been shuttered. Apparently their rent got raised, and there’s just “too much food on the block” so they had seen a decrease in customers. I’m sure having Shack Shack two avenues to the West, and Bill’s Bar & Burger 5 blocks to the north didn’t help either. Goodburger fans shouldn’t worry though. The rest of the locations are doing just fine, and ready to pick up the slack from the 45h street location. Thanks to Lunch’er Marissa for the tip. 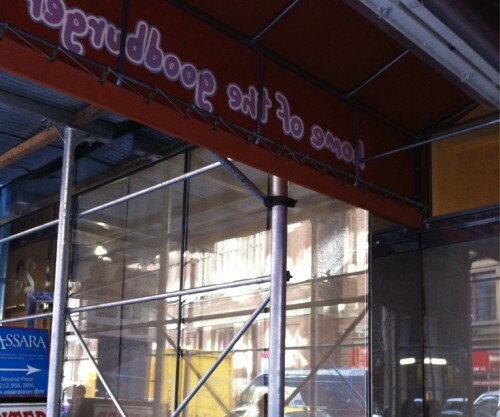 Posted by The ML Team at 1:30 pm, February 23rd, 2012 under Closed, Goodburger. I’m sad to hear it, but I’m not surprised. They had a large space and that place was never really busy when I was there. I’m sure the rent was expensive already. See ya Goodburger. Never liked ya anyway. Not surprised. While I enjoyed their burgers their service was horrible. the deathwatch began as soon as Five Guys opened up a couple blocks north of it…see ya!